Every year the Acadamae - Korvosa's prestigious school of the arcane arts - opens its gates to the city to host the Breaching Festival, where the most skilled infiltrators are invited to enter the magically guarded Hall of the Wards or die trying. Testing their luck against the university's strongest defenses, the competitors pull out all the stops as they vie for a chance at a fortune in gold and magical treasure. This year, the shcool's headmaster has invited the heroes to participate, against the contest's longstanding traditions. While the Breaching Festival has not seen a champion in over a century and a half, this year's festival promises to be the deadliest trial the school has ever known. Should the heroes reign victorious, the secrets they may uncover promise more than gold and glory - they may rock the very foundation of the Acadamae, and even the entire city! 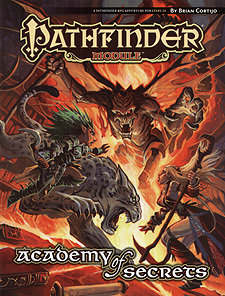 Academy of Secrets is an adventure for 13th-level characters, written for the Pathfinder Roleplaying Game and compatible with the 3.5 edition of the world's oldest RPG. It features a massive magical university, compatible with the GameMastery Map Pack: Magic Academy and teeming with sorcerous traps, weird puzzles, diabolical monsters, and countless students and professors trapped in a web of arcane defeit. Also within, you'll find a brand-new monster and details on one of Golarion's most famous schools of magic, as mentioned in Pathfinder Campaign Setting: Guide to Korvosa and the Curse of the Crimson Throne Adventure Path. While Academy of Secrets takes place in the metropolitan city of Korvosa, the magic academy within is suitable for use in any fantasy campaign setting.